I am totally loving all the Saje Essential oils. I have been using essential oils for some time now and have a few different oils in my cabinet for different ailments. 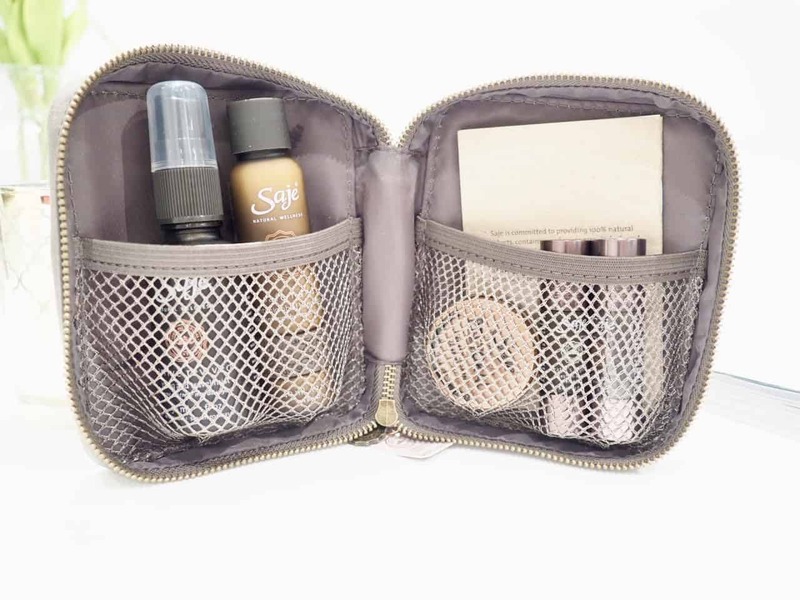 This is the perfect Saje travel kit to take along on your next travels. 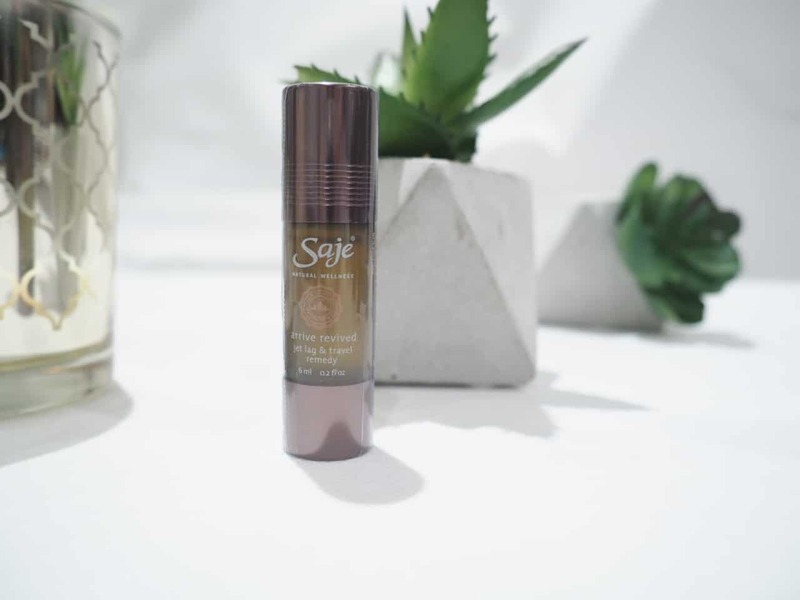 If you follow my blog you will know that I love Saje essential oils and love Saje products. Here is my Peppermint Halo review. I love that Saje is a Canadian company. 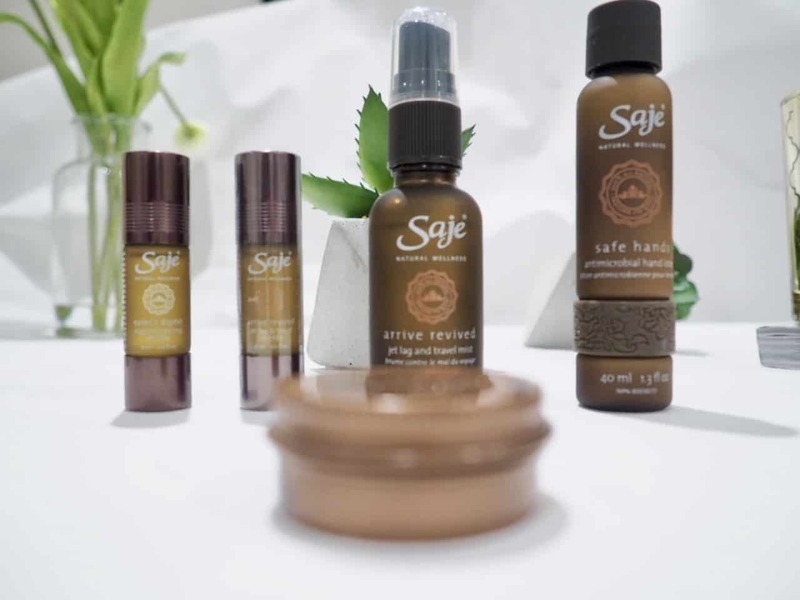 Saje was founded in 1992 by Jean-Pierre LeBlanc and Kate Ross LeBlanc, a passionate husband and wife team, Saje began introducing people to the healing power of 100% natural, plant-derived alternatives to pharmaceutical medicine. Essential oils have remarkable therapeutic properties and have been used in traditional cultures for centuries to enhance the physical, mental and emotional states of being. 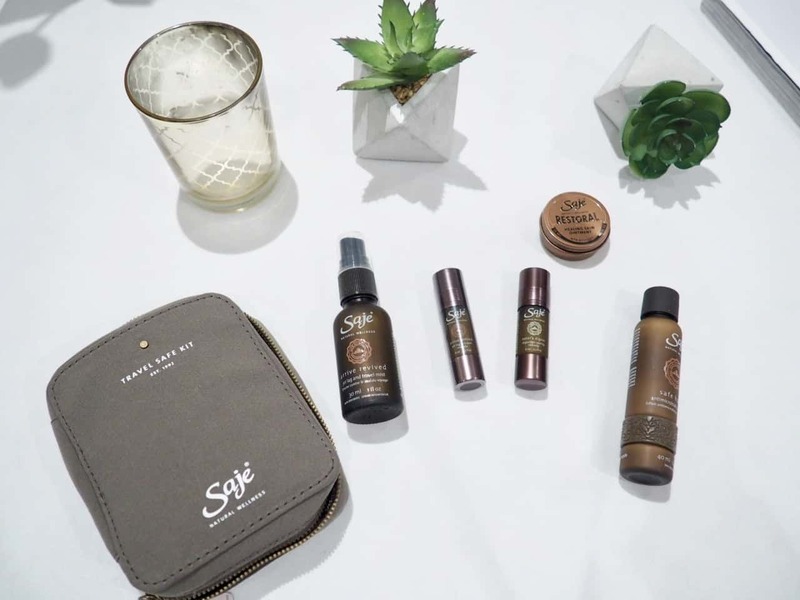 This Saje essential oil travel kit has everything you will need. 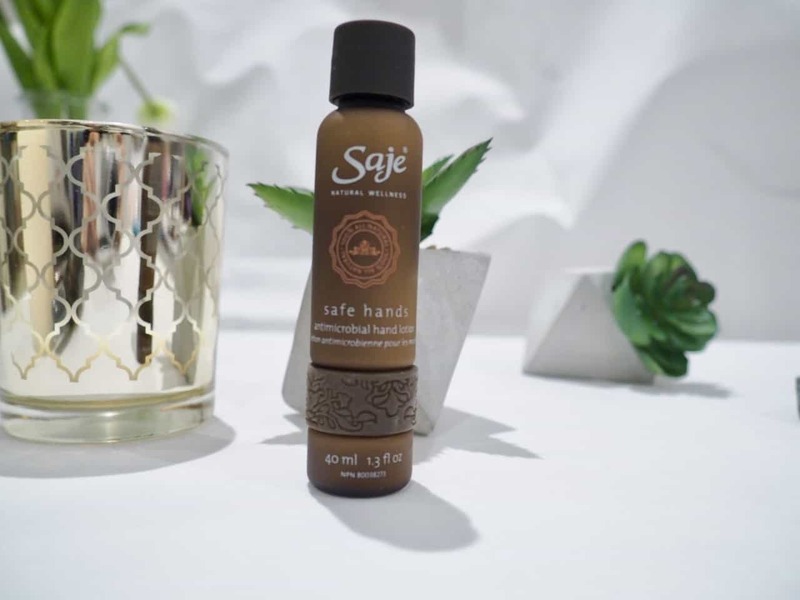 Saje uses 100% natural essential oils that are distilled from various species of flowers, grasses, fruits, leaves, and trees. 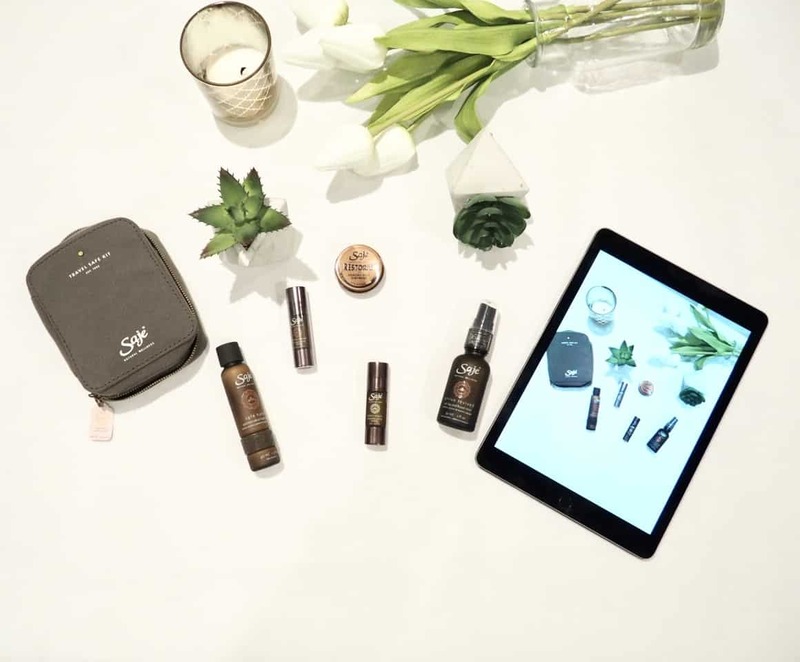 They consider essential oils to be nature’s life force – they capture the powerful healing qualities of the plants from which they are derived. The sad truth is that many essential oils on the market can be nature-identical, synthetic or adulterated in some way, and it takes the real thing in a 100% natural product to be truly effective and beneficial to our health. 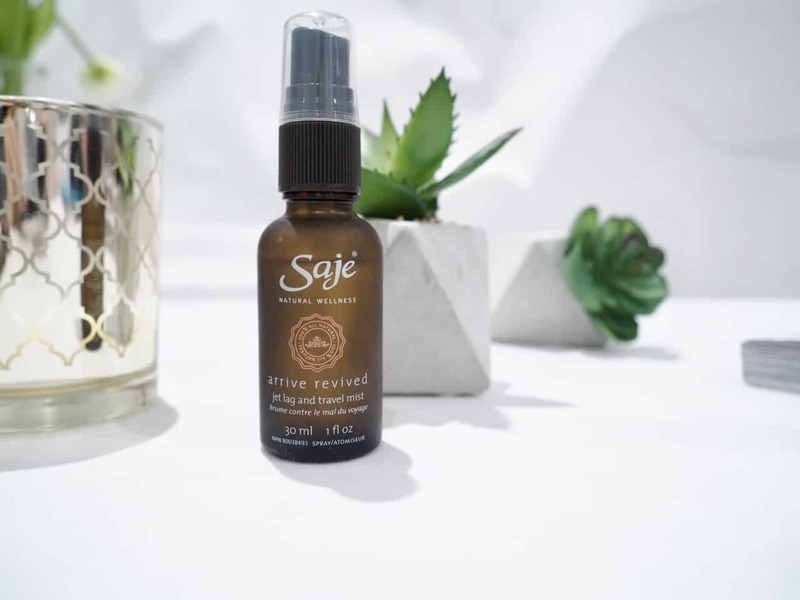 Saje offers only the best quality essential oils available, they source their essential oils from all different corners of the world. 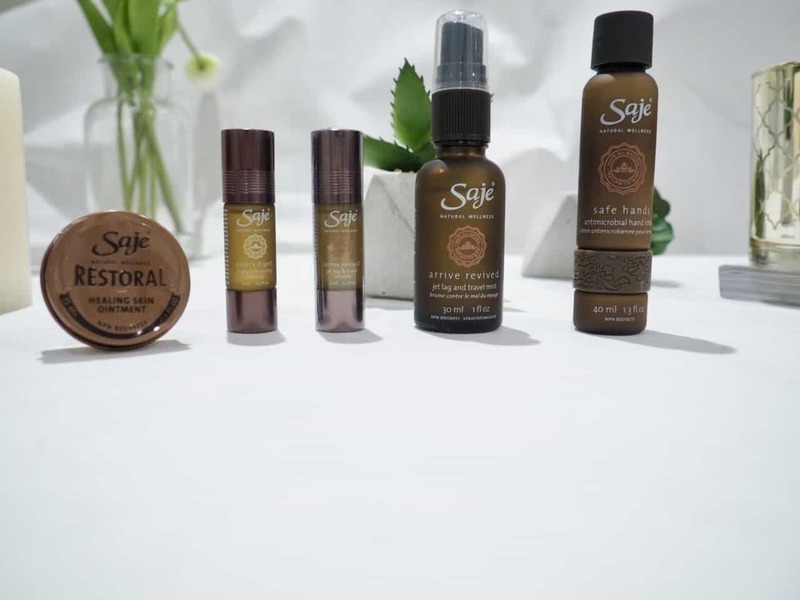 The Saje Wellness Travel Safe Kit is great for anyone looking for a compact aromatherapy kit to take with you on your travels or just to keep handy in your car or bag. 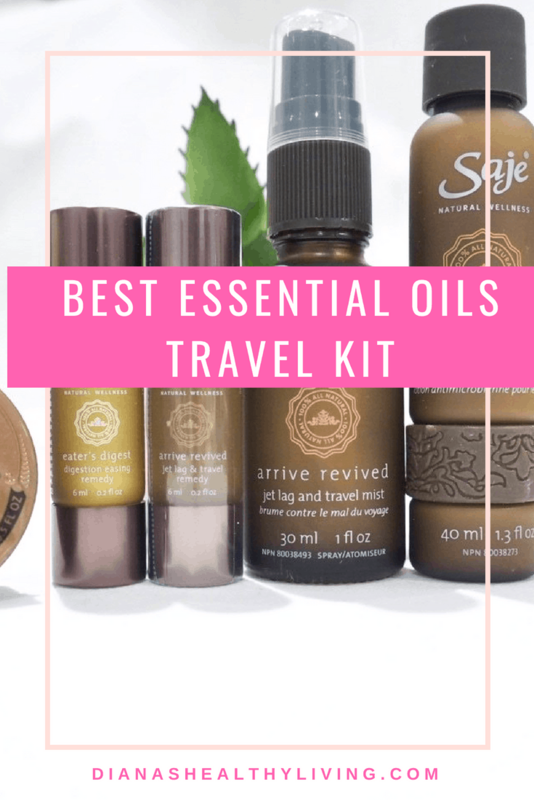 If you are new to aromatherapy then this is the perfect Saje travel kit for you. Apply to hands as desired. Gentle lavender and patchouli soothe skin, while fresh pine, tea tree, and thyme leave hands feeling invigorated, renewed and cleansed. This is great when you are out and about, especially on an airplane. Let’s face it, there are germs everywhere and when sitting on an airplane it isn’t convenient to get up multiple times to go wash your hands so this is extremely handy. I see people using hand sanitizers but I find hand sanitizers can be too drying and there are many articles stating that sanitizers aren’t actually great to use. Triclosan, the active ingredient in hand sanitizer, can kill off the good bacteria on your hands and allow anti-biotic resistant bad bacteria to grow. Mist face with eyes and mouth closed, inhaling deeply. Eucalyptus and niaouli refresh, while peppermint and rosemary boost the spirit and uplift the mind. I love face mists and this one is refreshing. This isn’t just for travelling but anytime you need to feel refreshed. The air on an airplane is extremely stale – I sprayed this a few times on the airplane and also when I landed. Apply directly onto the stomach to support healthy digestion and to soothe stomach discomfort. Massage in gently, as desired. I have never used an essential oil to support digestion so this was new for me. It smells great. It contains fennel, chamomile, and peppermint. To use this you roll it onto your stomach to soothe discomfort. I can’t say if this works as I didn’t have any discomfort but I did smell this and found it extremely refreshing and can see this having multiple uses. Energize, strengthen and balance yourself when you’re on the go. Apply to temples, under the chin and on soles of the feet. It’s amazing how essential oils work. Adults and children 12 years of age and older: apply to affected area 3-4 times daily. This is an amazing healing ointment for the skin. 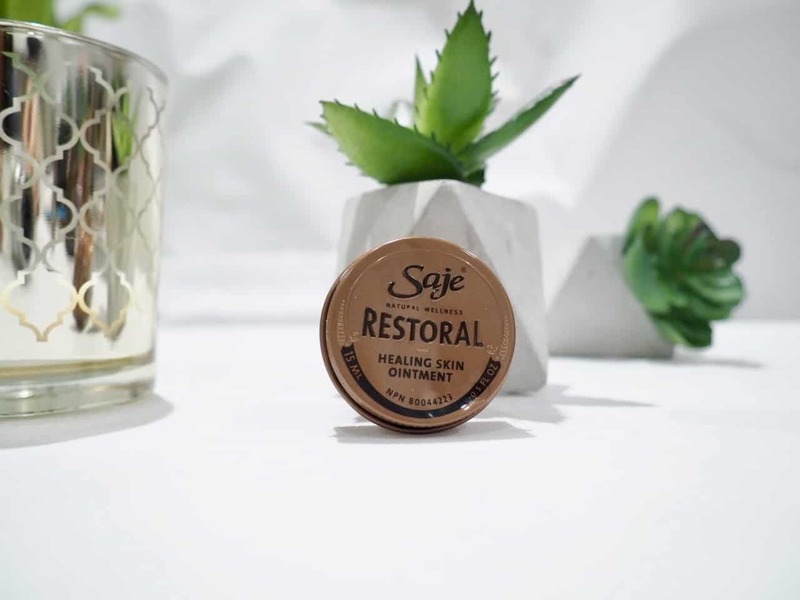 It contains pine tar and it helps to relieve itchy skin and treats chronic skin conditions such as psoriasis and eczema. Eucalyptus helps to relieve aches and pains and comfrey promotes moisture retention. My husband used this as he broke out into a rash on his arm and this helped to stop the itch and helped heal his skin. I love that the oils come in their own convenient travel case. Great to keep all your essential oils together. Do you use any essential oils? 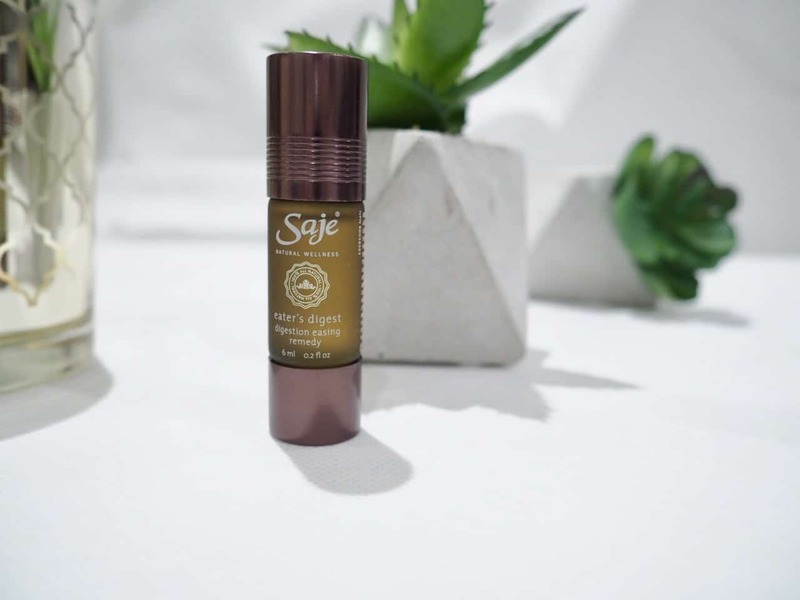 What are your favourite Saje essential oils? Have you tried their diffusers? Love this blog, so informative. Must try the digestive relief, as recently diagnosed with GERD…. this might help on days when the meds alone don’t do the trick. Thank you for this post. I just love your blog, great esthetic and great content. Big bravo! That is such a perfect bundle of oils. The packaging with the bag and all is so prudent for traveling. I’m always amazed at what oils can do for the body and how restorative they are to every day functioning. I love Saje! I received Peppermint Halo for Christmas and I’ve been using it in place of Advil to combat my frequent headaches. Very interested in that facial mist! I love essential oils and use them daily. Can I share this post for my Pinterest followers? 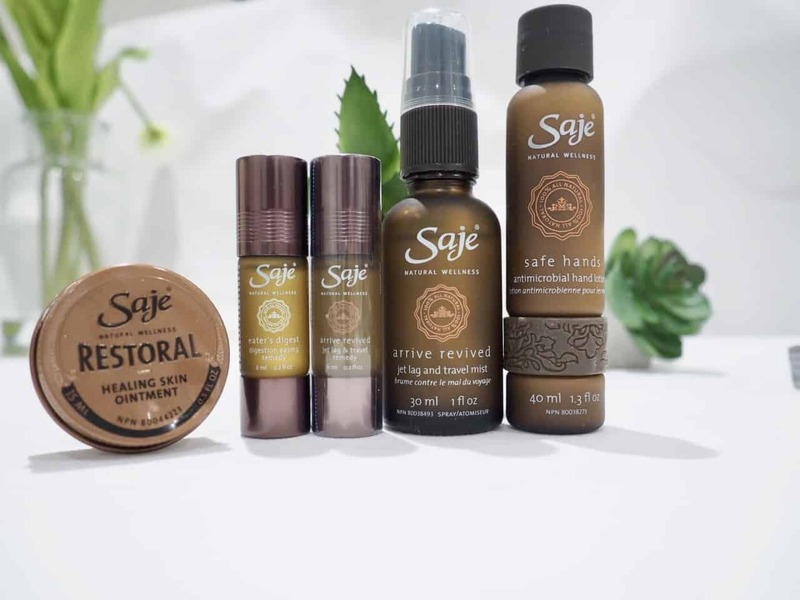 I used Saje essential oils they are good, highly recommend! They are one of my favorites. Of course, you can share. Thank you. Essential oils are a part of my daily life! 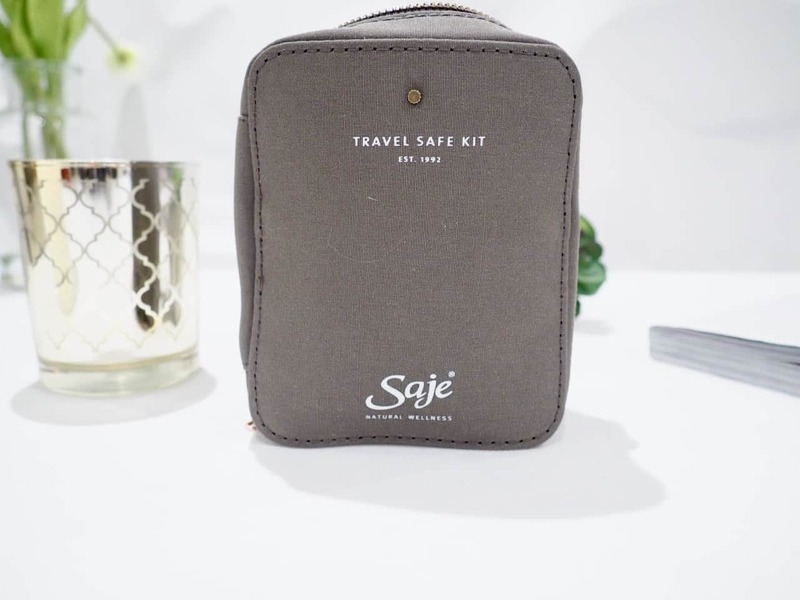 I tried Saje wellness travel safe kit and it was awesomeness! Thanks for sharing! Thanks for the information. I was wondering if you could answer something for me. Can you use essential oils everyday? I mom was asking me and I’m trying to find out for her. I appreciate any answers you can give me. Essential oils can be used daily. My diffusers are running daily.